With few exceptions in RSA, the general temporal trend of levels of Petroleum Hydrocarbons (PHC) in sediments & biota have been decreased during the period 1994-2005. 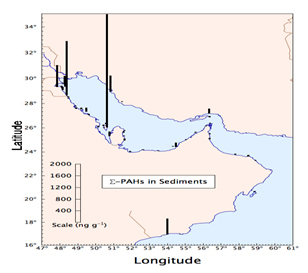 Levels of PCH in Sediments lie actually within the permissible level for the Region (15µg/g, as CEU). Chronic PHC pollution in RSA prevails in the vicinity of the BAPCO industrial complex (Bahrain), at Mina al Fahal (Oman) and to lesser extent in the surroundings of Sulaibikhat & Doha Bay (Kuwait). PHC concentrations in biota have decreased to values reported before the 1991 War. Prevailed PHC levels in fish and bivalves are actually comparable to those concentrations observed in relatively unpolluted areas elsewhere in the world. The historical high levels in Oysters from Mina al Fahal (Oman) and around Akkah Head (UAE) are still maintained.